It is not always a pleasant thing to think about, but family emergencies are a reality. The best way to handle a family emergency is for everyone to understand what the plan of action is. Having a family emergency plan in place can alleviate confusion. Young children also feel much more secure about emergencies when they know what they should do in those situations. Being prepared and educated is very empowering for your family. 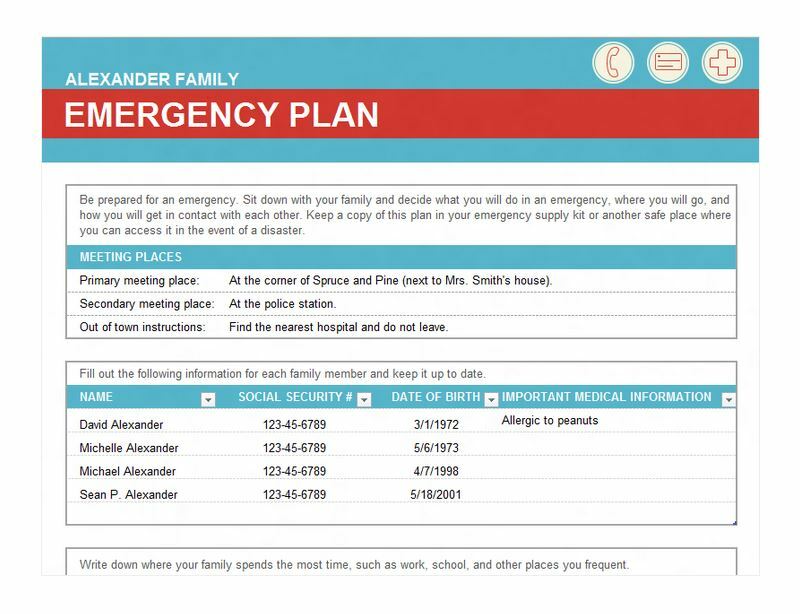 Downloadable family emergency plan templates can make crafting your family emergency plan a very simple job. The template is available for free on this page. The template is customizable to your family’s personal information. The template is also very easy use and downloadable right here. This template provides space to outline important family information and important phone numbers for use in the event of an emergency. There is also space to detail meeting places should your family not be together when an emergency takes place. Not only can you put in meeting places for your own hometown, but also out of town instructions should your family experience an emergency while on vacation or out of town. Take time to fill in your family’s own personal information. After you have created your family emergency plan it is a good idea to have a family meeting. During your family meeting you can give copies of the plan to all family members and also establish a central place in your home where the plan will be posted. This is the perfect time to go over all of the details of your family emergency plan and makes sure that everyone is well informed of what to do and who to contact in the event of an emergency. If you have very young children you may want to consider doing some role playing to help them practice the elements of your family emergency plan. Make sure not to make the role playing too frightening for the child. You want your children to be prepared for emergencies, but you do not want to create an unnecessary fear of the unknown in very young children.Once everyone is well informed of your family plan you can help all the members of your family choose a safe place to keep their own personal copy of the plan. Also make sure everyone knows where the family copy will be posted in your house. Eliminating confusion is the best way to help your family stay safe in an emergency.